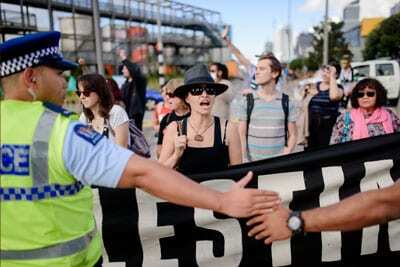 A line of police prevented conflict restrained a small group of Auckland Peace Action protesters at an Israel 70th anniversary event. Independence Day is Israel’s national day, commemorating the Israeli Declaration of Independence in 1948. 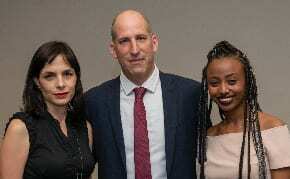 Communities around the world celebrated this event including Auckland – to mark Israel’s 70th birthday. 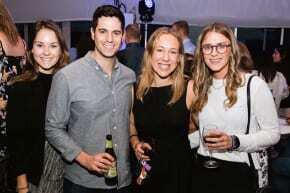 The Auckland celebration was held at Silo Park at Wynyard Quarter and attracted a diverse group of Israel supporters and key contributors including The Jewish Federation of New Zealand, The New Zealand Jewish Council, Israel Institute of New Zealand, the ICEJ, FCF, Ebenezer, and The Zionist Federation of New Zealand. Christians for Israel were core supporters of the weekend’s activities. 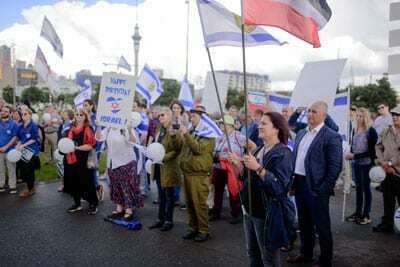 One Auckland Jewish community member in attendance, scientist Leonard Bloksberg confirmed on his Facebook page that there were up to 200 people in attendance to support Israel, freedom and peace. 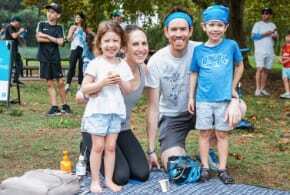 “I counted 6-12 people involved in the protest calling for destruction of Israel and Jews,” Bloksberg said. However, threats against some speakers meant they had to pull out of the event. Police successfully stopped the group physically disrupting the afternoon’s celebration. The protest group disagreed with the celebration of the day claiming that “ethnic cleansing” of the Palestinian people continue in the West Bank and the Gaza Strip. May 14, 1948 is a commemorative date and marks a day of independence for Israel as they fought off armies to claim their own state. Spokeswoman for Auckland Peace Action, Valerie Morse says celebrating the Jewish state’s oppressive ways is wrong. 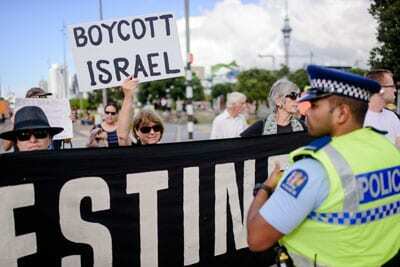 The Zionist Federation say the Auckland Peace Action group’s protest is disappointing.